Idaho, United States: Starting this summer, owners of most 2015 Buick models can be connected by the high-speed data of OnStar 4G LTE. A built-in Wi-Fi hotspot will keep passengers connected on the go, allowing them to browse the Internet, download movies, play games or send email on up to seven devices at once. Buick announced today at the DENT Conference that the 2015 LaCrosse, Regal, Verano and Encore would come standard with OnStar 4G LTE hardware, with data packages available for an additional charge. The 4G LTE technology in these four models is faster than the 3G connectivity offered by some competitors. 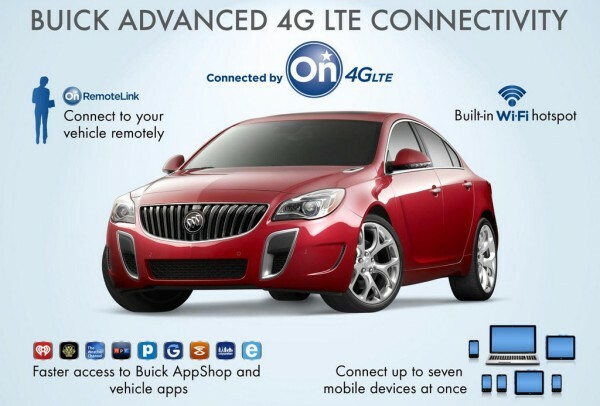 Available in the U.S. and Canada, OnStar 4G LTE hardware will be in every Buick model by the 2016 model year. The Wi-Fi hotspot will allow passengers to connect their personal devices, such as compatible smartphones, laptops and tablets, to high-speed wireless Internet. Business travelers can check and respond to emails from a rest area, families can play games between devices, and drivers can stream their favorite Internet radio apps via a new Buick AppShop. 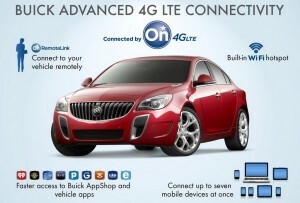 Every 2015 model offered with OnStar 4G LTE will also come with Buick AppShop, a feature of IntelliLink. Through Buick AppShop, owners can use their 4G LTE connection to download apps and stream data – such as Internet radio playlists – through the in-vehicle interface. Buick AppShop will continue to grow, and all apps can be updated to newer versions as they become available. While final content has not yet been determined, initial apps are expected to include iHeartRadio, Priceline.com, the Weather Channel, NPR, Slacker Radio, Cityseeker, Eventseeker, Glympse and Kaliki, with more coming throughout 2014 and beyond. Later this year, a Vehicle Health app will provide in-vehicle diagnostic reports and allow owners to schedule a maintenance appointment from the car. The Vehicle Health app pulls diagnostic data from the vehicle, providing a level of vehicle integration not possible with a smartphone. With OnStar’s 4G LTE connection, the vehicle provides a mobile hub, giving customers easier access to apps and services that require a high-speed cellular or data connection. In collaboration with AT&T, the data connection in the car will be fast – and flexible. Current AT&T customers can add their vehicle to a shareable bucket of data through AT&T Mobile Share plans. All drivers can pay for data through OnStar, independently from their other mobile data accounts. Pricing and data packages for OnStar 4G LTE will be announced later this year. Buick owners also get the OnStar RemoteLink Key Fob Services, which allows owners to lock or unlock doors, activate the horn and lights, and remotely start a properly equipped vehicle using the OnStar RemoteLink smartphone app. The Key Fob Services are included for five years for Buick vehicles in the U.S. and Canada.